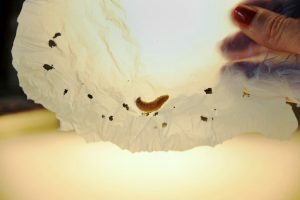 Researchers in Europe have found that the larvae of a common insect have an unusual ability to digest plastic, a discovery that could lead to biotechnical advances that help deplete the continual buildup of one of the world’s most stubborn pollutants. Scientists discovered that the wax worm, a caterpillar used for fishing bait that takes its name from its habit of feeding on beeswax, is able to break down the chemical bonds in polyethylene, a synthetic polymer and widely produced plastic used in packaging, bags and other everyday materials. Federica Bertocchini, a scientist with the Spanish National Research Council, stumbled upon the insects’ unusual ability several years ago. An amateur beekeeper, Ms. Bertocchini had plucked several worms out of her beehives and was keeping them in a plastic bag. She soon discovered that the worms had chewed holes in the bags and, realizing the potential implications, got in touch with peers at the University of Cambridge, Paolo Bombelli and Christopher J. Howe. A paper that the group published this week in Current Biology explains how they discovered exactly what allows the worms to break down the plastic. To answer the question, the researchers employed what Mr. Howe delicately referred to as a “homogenated worm.” The scientists ground the larvae in a blender and spread the resulting paste on the plastic. That showed that it was some chemical or combination of chemicals within the insects that was causing the plastic to degrade. That mystery enzyme or enzymes is breaking the long chain of carbon atoms at the center of the plastic into smaller containing molecules, Mr. Howe said. And while the researchers are not yet sure what those smaller molecules are, it is likely that they will be easier to recycle and reuse than the plastic from which they came. Next, the scientists will begin to isolate individual elements within extracts from the worms, in an attempt to narrow down the chemical breaking the plastic’s bonds. If they are able to isolate that enzyme, then it might be possible to obtain the gene governing it and to insert that gene into a bacteria, which could be easier than cultivating the worms. Eventually, that bacteria could be used as the basis of a biotechnology process, Mr. Howe said. He cautioned, however, that it would be at least several years before the initial discovery could lead to such a result.